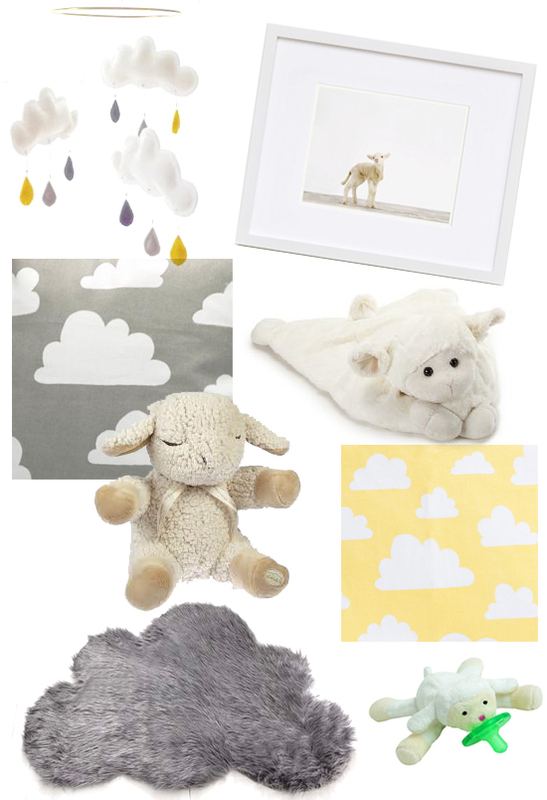 More ideas for details for the new nursery: fluffy little clouds and fluffy little lambs! Lamb Print. From The Animal Print Shop. Lamb Belly Blanket. Little A received a blue bear belly blanket from (my all-time favourite baby shop) B. Braithwaite as a gift from friends when he was little and he still loves to cuddle with it. Before we left Atlanta we bought a lamb belly blanket and put it away for Baby #2. I can’t wait to bring it out! Yellow Cloud Fabric. For cushions or bedding. Lamb Wubbanub. Cute. But not as cute as the monkey or giraffe. Cloud Rug. This is a DIY by Say Yes to Hoboken. Cloud B Sleep Sheep. Alec has a sleep sheep and a mini sleep sheep (sleep sheep on the go) and our place seems to almost always sound like the ocean. For Baby #2 we will probably just get a mini sleep sheep.